Montecito Heights Residents! Print out this wonderful booklet for your coffee table! You're a part of history now. Here is the much requested historic pamphlet "Montecito Above The City". Provided by friendly neighbor and historian Bruce Hoel. Thanks Bruce! I love this hill very much. I was born here, raised here and will most likely die here - God willing. I'm so happy to see such a united community. I don't think I have the time to sit and think about all the memories that my family and I have accumulated. My son is the fourth generation to live in Montecito Heights. (I once told my husband that once you live on "the hill", you don't want to leave. Sure enough, when we bought our house, he fell in love with the hill. My mother still lives here, and I pass my grandmother's old house every day. A previous owner of my grandmother's house told me the house was haunted by two ghosts; a male and female. Could it be that my dad and Grandma haunt their old home? (That's another story). I remember when horses where allowed to be kept on the hill. There would be times when I would see a few riders going down Roberta St. wearing Charro hats. Or when a neighbor across the street had a Palomino and my mom took a picture with it. I also remember when Glen Alta Elementary was torn down, and all the kids went to class in the bungalows. How modern the new school looked when it was finished! I too remember when the kids would use cut up cardboard and slide down the hill when the weeds where tall and green. Or when the fire season would start, and the poor fire department came out time and time again on the same day. Times have changed, as most people are fond of saying. I know my sons will not have the same memories that I have of Montecito Heights, but they will have their own new ones. And we do share a few still, like the "Coyote's Lullaby". My father built an adobe brick house with his own two hands at 965 Montecito Dr. around 1950-51. We lived there until Feb 1967. We were renting a house on Vanhorn in El Sereno while he worked on the house. He was doing 40 hours at the phone company at the same time somehow. I had an envelope of pictures around here but haven't seen them in years of my father building that house. The pictures show the 8x8 redwood beams going up first. He said after a while he could go to the brick piles and grab a brick in each hand. They were huge. There were a lot of vacant lots back then. If I ever go there to meet whoever lives there, I can point at the footprints in the concrete of my sister and I near the front door. I remember we rarely locked our doors back then. I remember the old Barbara Ann bakery Chevrolet panel truck coming down our back street. In the back he had large wooden drawers filled with fresh bread and donuts. In the afternoon you could smell the bakery that was down along the Pasadena freeway. To access the street and mailbox below my father installed an old black fire escape stairway, which he paid $20 for back then. Many of the neighbors above us would use the "fire escape" as a shortcut after walking up the hill to go up their homes on Pagoda Pl. behind us. Our next-door neighbor to the left had a driveway that went from Montecito Dr. in front to Pagoda Ct. in back but he wasn't very friendly. This was years before they built the "stilt houses" that blocked our view of the city below. We could always see the Angeles Crest National forest and most of Highland Park, Mt. Washington, Eagle Rock and parts of Glendale and someone said we could see parts of Sunland. Sometimes we could hear a loud jet engine far off in the distance. That was the test cell at Redstone?, I guess up near Chatsworth. We had four large windows in the living room that looked out to the northwest. Stepping out to the front patio we could see to the far left Dodger Stadium and to the far right Mt. Baldy. Of course the Southwest museum was a big part of that view. I remember when the Shoppers Market opened up on Figueroa; it was a big deal to bicycle over there now and then. It was first supermarket in the area. We were always bicycling or skateboarding far off, sometimes to Glendale. I remember waking up in the morning to the smell of the weeds on the hills burning somewhere. In the summer while on our break from school, the fire department would burn the hills so they wouldn't catch fire on their own. So on those days we would often seek out the firemen and watch. Big Flattop and Little Flattop were favorite places for hikes. I made a path up the front face of Big Flattop with my motorcycle. My best friend and I could go up and down that for fun. Bicycles didn't do well on that sand around the flattops. I remember the trapdoor spiders. I once dug up the whole assembly and took it to Latona elementary for show and tell. Somewhere in the mid 1960s, my mother started the "Montecito Hills Improvement Association" with of many goals to get the street widened. Along with many neighbors, they used to meet at the building on the L.A. City athletic field at the end of Homer St. north of Ave. 43. (The Montecito Heights Improvement Association still meets there - at the Senior Center - ed.) On this site I saw a reference to the two stores at the bottom of this hill. At Griffin and Ave. 43 on the east corner there was the "green store" and Bessie, an old Japanese lady was ALWAYS behind the counter. That was our favorite place for candy. Since she was often busy at the counter, we would turn left and wait for her attention at the little wood swinging gate behind her. That was better because from there we were closer to the candy and we could point to what we wanted. We rarely used the store on the west side of the street, but my mother liked the meats there. Sometimes we would flip bottle caps across the street and run across and flip them back. I remember we favored RC cola because it came in a bigger bottle for the same price. The gas station was managed by my best friend's father for a while. Sometimes at Christmas, our Boy Scout pack would sell Christmas trees from the back of the gas station. Going back up the hill on bike up Montecito was quite a pain and over a mile, so often we would push them up the dirt trail. In 1957 my father owned a new Triumph TR-3 sport car. Around 5:30 everyday you could hear him sliding around the corners sideways going up Montecito. He had to sell it later on because my mother wanted wall-to-wall carpeting. I remember early in the morning you could see a brown wall of smog going straight up in the air from the cars on the Pasadena Freeway. The hills to the north of Montecito Dr. were very popular for our motorcycles and other pursuits. 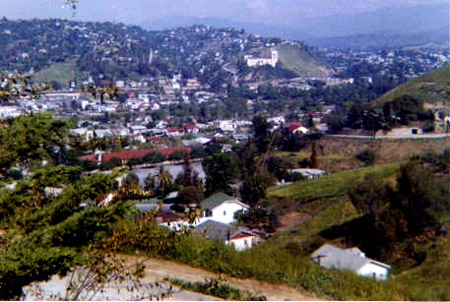 L.A. City Councilman Arthur K. Snyder stopped a lot of that by putting up a chain link fence around the hills. When I was around 14 to 17 there was a very pretty blond girl who lived several doors down Montecito. I was incredibly nuts about her and being so insecure I could never tell her. I remember the date, on June 1st 2000, I was surfing on the net and happened into one of those high school sites and there she was. I emailed her, she emailed back and we have been trading emails from several times a month to sometimes several times a day since. She lives in Montana and sorry to say is spoken for. In 1995, I was working on computers in the ARCO tower at 5th and Flower downtown. I was in an office on the 43rd floor one day where it actually seemed we were looking down at Highland Park, which was clearly right outside the window. The lady whose computer I was working on was about my age. I asked if she grew up in the area. She pointed towards Highland Park. I asked what year she graduated from Franklin High. She responded summer 66 while giving me an odd look. I said wasn't that 155 students? Another odd look. Turns out we were in the same class in two of my three years at Nightingale Junior High and the three years at Franklin. We didn't remember each other. After acknowledging all of that she goes out of her office and brings in her friend Rosie. Turned out Rosie and I were not only in those schools together in the same class but also in the same class at Latona Elementary for six years. Keith would love to hear from you too! Here's his e-mail address if you have a memory you'd like to share. Or send it to me if you want me to put it up on the World Wide Web! When I first moved onto Montecito Drive in January, I of course began walking my dogs out on the dirt road to throw a ball and look at the view. I can look North and see Mount Wilson, part of the heritage of my work place at Carnegie Observatories in Pasadena. At night its little light floats like a watching space ship over everyone within fifty miles. I can turn around and watch the Bonaventure hotel and all the other Los Angeles landmarks. Height and distance make everything seem peaceful. After one of my walks I went and wrote a friend that I feel like I'm standing on a hill in 1935 and looking at the twenty-first century. I said this to a number of people, actually. A magical thing happened on my very next walk. I went out to Little Flat Top with a bag to pick up glass and stuff and was picking up what I thought was a rusty bottle cap full of dirt. I almost threw it in the bag with the trash, but it felt funny, so I knocked more dirt off of it and the object turned out to be a buffalo nickel, dated 1935. This is now my lucky charm of home ownership. Thanks for that wonderful story, Scott! You've taken on a rescue mission here in Montecito Heights. And we love you for it! This photo was taken in the mid 50s, from the front of our house looking across the arroyo at the Southwest Museum. From an historical point of view, you may be interested in this about our little house. My folks bought the house for $4950.00 in the summer of 1952. There were seven houses in a row, with empty fields all around. The houses were stucco on cement slabs, with plumbing and electricity put in, but only bare studs on the interior. Most of the seven families did the finish work themselves. My father put up knotty pine walls in most rooms, and I personally (an 11 year old kid) set every nail head with a hammer and nail set and filled the holes with wood putty. My mother stuck down asphalt tile squares on the floors. We also planted ivy and ice plant to cover the front hill, and my father hauled in some old curbstones to create the steps which are still in place. Did you mention the cesspool and septic tank? We were only a few of the houses that were not on the sewer main. Also, did you tell her about the wild life in the fields and the surrounding hills? Tarantulas, trap door spiders, scorpions, coyotes, roadrunners, chicken hawks. I bet they are scarce now. Actually, except for the scorpions and roadrunners, these animals are doing extremely well! The residents have made it a high priority to preserve the natural arroyo lands we enjoy. We love our little wilderness sanctuary, and if you want to read more about it, check out our Nature page. Once while digging around in the diatomaceous earth behind our house on Montecito Dr. when I was a young teenager, I discovered a fossil of an ancient fish. I don't know what became of it. At one time I had quite a collection of things that I found nearby our home. I was truly impressed with the tarantulas and trapdoor spiders and all the other interesting flora and fauna. Sounds like Montecito Heights has been a lush and lively home for wildlife a lot longer than we thought! The diatomaceous earth still attracts the interest of local kids; when I first bought my house, I also bought some local 'natural chalk' from a neighbor girl. Thanks, Jon! The 1950s was a different world, everywhere I guess, but that area was a wonderful place to for kids to run in those days. Our parents felt it was safe, and we were unafraid. We slid down the hillside, across the street from our house, on flattened cardboard boxes, built an underground fort in the field, played ball in the playground at the bottom of Montecito Drive, and even explored the storm drains of the LA River. There was a Soapbox Derby track -- I believe a nursing home sits on the site now -- where a big event was held every summer. And we would walk to the Southwest Museum in the hottest days of summertime because it was always cool inside, and it was free. We measured the distance to the soda coolers and candy counters of the two little markets at Griffin and Avenue 43. It was a mile if we followed Montecito Drive down to Griffin Ave., but only a quarter mile if we took the dirt trail, which we called the "goat path", from the deadend of Avenue 43 up the ravine in front of our house. The choice would seem obvious, but there was always a chance of getting a ride if you were on the road, especially important when you were going up! Thanks, Harriet! Montecito Heights still is a wonderful place for kids to run, and may be as beautiful as it is now because of the strength of your love and care then. Thanks for sharing a touching and wonderful glimpse of our history. And please come back and visit any time! Have any memories you'd like to share? I'd love to hear them! E-mail me!